DTOPO has rolled out Visionist 1.0. The free app uses computer vision utilizing neural networks to generate artwork based on user's images. When a style is applied to a user's image, the neural network attempts to transfer the style it was trained to the user's image. 2K and Cat Daddy Studios have launched NBA 2K Mobile. The free app lets gamers experience their favorite NBA moments, build dream teams, and step onto the court in lifelike 5v5 match-ups. NBA 2K Mobile users collect player cards to build their dream squad and use drills to train up their players. Users can compete in Seasons to earn new rewards, participate in limited time events for exclusive cards, and rise up the leaderboards. Assassin’s Creed Rebellion, a free-to-play strategy RPG mobile game from the award-winning Assassin’s Creed universe, is now available at the Apple App Store. In the game, set in Spain during the height of the Inquisition, players manage their own fortress and forge their own Brotherhood by recruiting and training more than 40 Assassins. As they upgrade skills and become more powerful, players will spark the rebellion against the Templars and lead epic missions with custom teams of three Assassins from their Brotherhood. Avast, which specializes in digital security products, has launched Avast Mobile Security. Available in both a free and a premium version, it helps Phone and iPad users guard their identity, browse safely and privately, connect to secure networks, and protect personal data such as photos. FileShadow has released the FileShadow Desktop App. It aggregates files stored in Apple iCloud with other cloud storage systems, along with local and direct attached storage (DAS), including Drobo direct attached appliances with support for the newly announced Drobo 8D. FileShadow connects the majority of all cloud and macOS storage options into one secure cloud vault, delivering a single consolidated catalog of files. With the app, files and photos placed in iCloud from a Mac, a browser, an iPhone, or any Apple device can become part of the FileShadow archive. The FileShadow Service is free of charge for up to 100 GB of data. Subscriptions are available for more storage ($15/month for 1TB; each additional terabyte is $10/month). Zevrix Solutions has announced Output Factory 2.3.16, a compatibility update to company's output automation solution for Adobe InDesign. 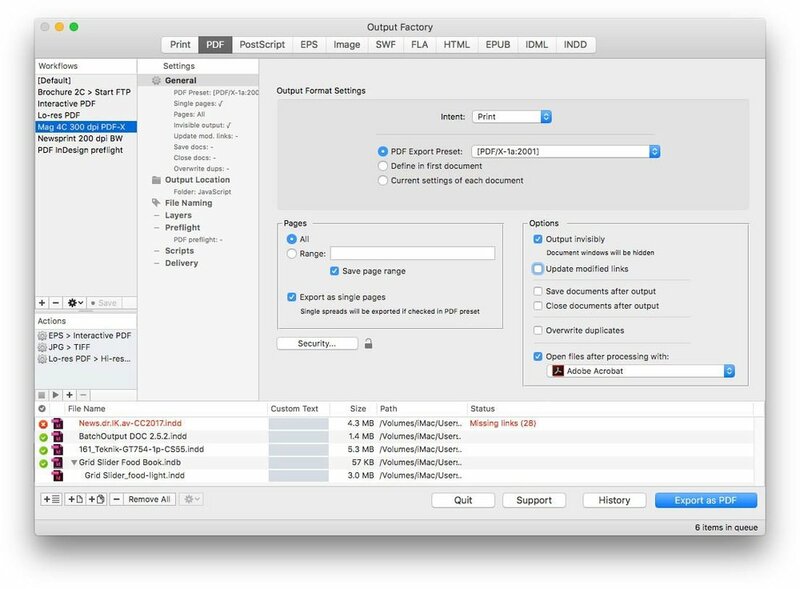 Output Factory automates printing, exporting and post-processing from InDesign and offers batch processing, export as single pages, variable file names, layer versioning, preflighting, detailed history and more. Version 2.3.16 makes Output Factory compatible with the recently released InDesign CC 2019 and the GoPublish system by Oppolis Software. Output Factory can be purchased from the Zevrix website for $169.95; a “lite” version is available for $119.95. A demo is also available for download. The update is free for the users of Output Factory 2.x, and $84.97 to upgrade from BatchOutput and Output Factory 1.x. Output Factory requires macOS 10.7-10.14 and Adobe InDesign CS5-CC 2018.